This is article #10 in a series of responses to Howard Denham, church of Christ minister, who considers himself to be the “final answer” to the truth of Covenant Eschatology. Denham prides himself– pride in the worst definition of the word – on being a master of logic and scripture. Yet, as we have shown in this series, he abuses logic and perverts scripture. And to make matters worse, his caustic, hateful and arrogant attitude is the very epitome of what a Christian minister should not be. It is truly sad. In this installment, I want to look closer at Denham’s argument as it relates to the judgment of the living and the dead. He made the point in his syllogism concerning the apostasy. Be sure to read the previous articles in which I dealt with the NT doctrine of the Great Apostasy. Here is Denham’s syllogism again, and notice his focus on the judgment of the living and the dead. Major Premise: If it is the case that the judgment of the quick and the dead at the appearing of Christ and His kingdom occurred at the destruction of Jerusalem in A.D. 70, then it is the case that the prophecy of the apostasy of 2 Timothy 4:1-4 and the preaching of the Word to counter it were limited to a two year period from A.D. 68 to A.D. 70 and the dstruction (sic) of Jerusalem. Minor Premise: It is not the case that the prophecy of the apostasy of 2 Timothy 4:1-4 and the preaching of the Word to counter it were limited to a two year period from A.D. 68 to A.D. 70 and the dstruction (sic) of Jerusalem. Conclusion: Therefore, it is not the case that the judgment of the quick and the dead at the appearing of Christ and His kingdom occurred at the destruction of Jerusalem in A.D. 70. Like his previous syllogisms, Denham’s argument here is fundamentally flawed, and a direct contradiction of Scriptural truth concerning the judgment of the living and the dead. Obviously, this is a vast topic, so, I will limit my comments to a couple of texts. Now, in Denham’s fellowship, verse 27 is taken to be a reference to the “end of time” judgment, i.e. the judgment of the living and the dead.” Verse 28 is said to have been fulfilled on Pentecost. Needless to say, this is nothing but a “gap theory” and literally has no textual or contextual justification. It is purely presuppositional. Now, if it can be shown that v. 27 is synchronous with v. 28, then Denham’s entire eschatology is destroyed. It is that simple. He cannot admit for one moment that the judgment of every man took place in the lifetime of that audience. And yet, that is precisely what the text demands. 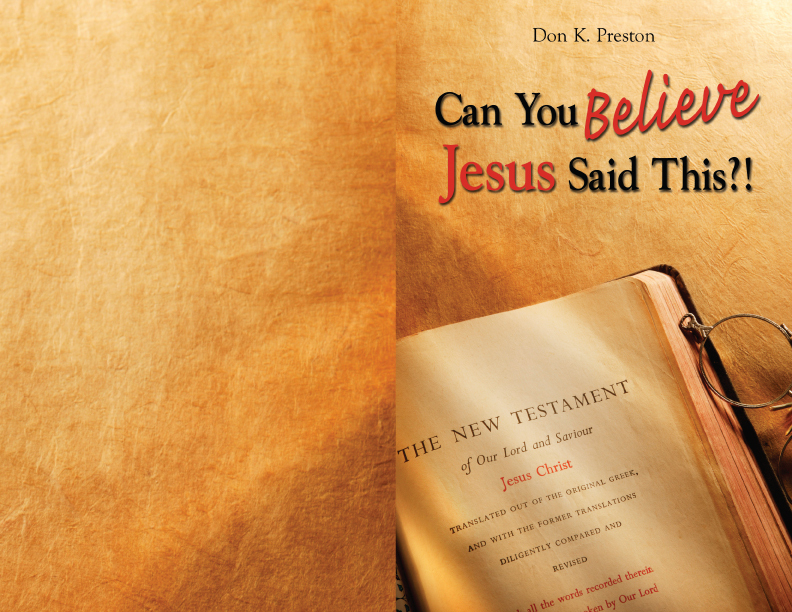 This book proves beyond doubt that Matthew 16:27-28 cannot be divided! <<Strong’s Exhaustive Concordance reveals that the phrase, “verily I say unto you” (Greek, amen Lego humin), is used 95 times in the New Testament. In every occurrence, this little phrase “verily I say to you,” emphasizes a topic already under consideration, and to emphasize additional information that is about to be offered. Unless amen Lego humin is being used in a totally unprecedented way in Matthew 16:28/Mark 9:1, there is not one place in the New Testament where the phrase introduces a new discussion. The phrase is always used to emphasize a statement about a subject that is already under consideration! Think of what that means here. If verse 27 cannot be divided from verse 28 then simply stated, the judgment of the living and the dead was in the first century, in the lifetime of that audience. The burden of proof is squarely on Denham and his crowd to show that amen lego humin is being used in a totally unprecedented way in Matthew 16:28– and he cannot do that. By the way, take note that in Revelation 22:12 we have Jesus reiterating Matthew 16:27, and stating, “Behold, I come quickly!” His coming, to reward every man, was at hand and coming soon. The language is inescapable. There could hardly be a more emphatic declaration that the judgment of the living and the dead was going to be in the first century, at the time of the judgment of Jerusalem! All the blood of all the righteous martyrs – all the way back to Creation! – would be avenged and judged in that generation– that is the judgment of the dead. Normally, Denham’s fellowship concurs that in Matthew 23 Jesus was speaking of the impending judgment of Jerusalem, but, that is a fatal admission, for it is undeniably true that Jesus was speaking here of the judgment of the living and the dead. Peter said Christ was “ready” to judge the living and the dead. The word “ready” is hetoimos, and as the Expositors Greek Testament says, “Greek readers would understand the imminent judge.” (Grand Rapids, Eerdmans, 1970)71. Notice that Peter is writing to martyrs. His audience was in the midst of the fiery trial foretold by Jesus in Revelation 3:9f. They were suffering for merely being Christians (v. 11f)! They were participating in, “the sufferings of Christ” and thus, just as Jesus said in Matthew 23, their suffering was filling up the measure of suffering and, of course, the measure of sin on the part of their persecutors. Peter assured them: “The end of all things has drawn near” (literal rendering). Is the judgment of the living and the dead at the time of the end of all things? Denham would affirm that. But, that demands that the judgment of the living and the dead of v. 5 had drawn near, falsifying Denham’s eschatology! But, this is not all. But then, Peter said the time has come for “the judgment.” Not just some judgment, but, “the judgment” and it was, remember, the appointed time for the judgment! And there is a critical point to be noted here. When Peter said that the time had come for “the judgment” he uses what is known as the anaphoric article. Simply stated, an anaphoric article is used when a speaker or writer has spoken of a subject and then, later, to draw the reader / listener’s attention back to the subject already introduced, he uses the definite article. The anaphoric article is by far the most common use of the definite article according to the Greek Grammars. (See e.g. Daniel B. Wallace, Greek Grammar Beyond Basics: An Exegetical Syntax Of The N.T., 218). To put this as simply as possible, the use of the anaphoric article in 1 Peter 4:17 points directly back to the “judgment” of v. 5 – the judgment of the living and the dead. And, that means that Peter was affirming, “the appointed time has come for the judgment of the living and the dead.” That is the only judgment mentioned in the entire context. (Amazingly, I have heard ministers from Denham’s fellowship say that v. 5 is the end of time, verse 7 is AD 70, and v. 17 is, who knows what?? Maybe AD 70, maybe the end of time, but, who knows? But, there is simply no justification for such radical and arbitrary dichotomization of the text). There is no textual, grammatical or contextual justification for denying the unity of the texts, and thus, connection of verse 5, 7 and 17. There could hardly be a more powerful refutation and falsification of Howard Denham’s denial that the judgment of the living and the dead occurred in the first century, in the judgment of Old Covenant Jerusalem, the one guilty of the blood of the martyrs of God. Peter’s language is clear, it is emphatic, and it is undeniable. When we honor the use of the anaphoric article and couple v. 17 with hetoimos (ready) in v. 5, and then Peter’s explicit affirmation of the nearness of the end of all things in v. 7, it is a perversion of the text to deny the imminence of the judgment of the living and the dead. Thus, in our on-going series Responding to the Critics, we have exposed, once again, the total abuse of logic and the Biblical text by Howard Denham. The judgment of the living and the dead was in AD 70!